Looking for our tours in or around Bodhnath? There is nowhere quite like Bodhnath. 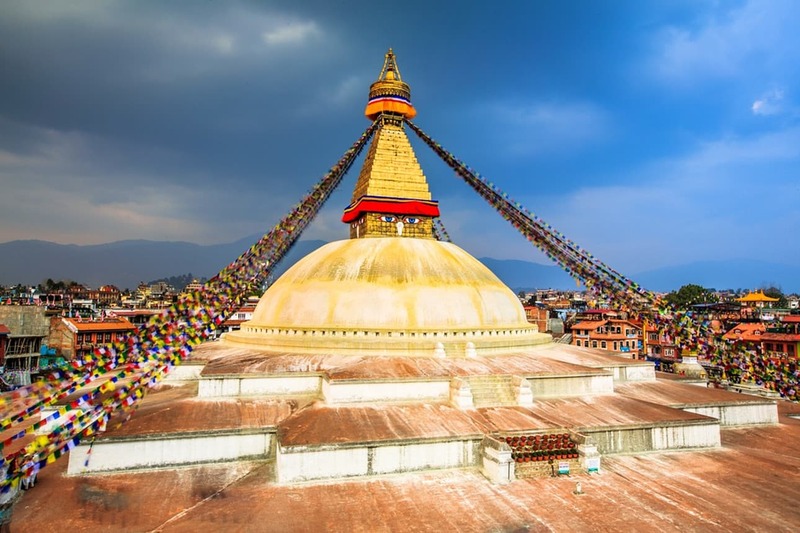 Asia’s largest stupa pulses with life as thousands of pilgrims gather daily to make a kora (ritual circumnavigation) of the dome, beneath the watchful eyes of the Buddha, which gaze out from the gilded central tower. Tibetan monks in maroon robes and with shaved heads wander the prayer flag–decked streets while pilgrims spin prayer wheels and stock up on yak butter and tsampa (roasted barley flour). This is one of the few places in the world where Tibetan Buddhist culture is accessible and unfettered, and the lanes around the stupa are crammed with monasteries and workshops producing butter lamps, ceremonial horns, Tibetan drums, monks’ headgear and the other paraphernalia essential for Tibetan Buddhist life. The stupa shook ominously in the 2015 earthquake, but only sustained some minor damage; at the time of writing, the tower was covered in scaffolding but it is expected to be fully restored. Historically, the stupa was an important staging post on the trade route between Lhasa andKathmandu, and Tibetan traders would pray here for a safe journey before driving their yaks on to the high passes of the Himalaya. Originally a Tamang settlement, today most of the people living in the village of Boudha (pronounced boe-da) are Tibetan refugees who fled China after 1959. The stupa also attracts many Sherpas, descendants of eastern Tibetans who migrated to the Everest region of Nepal in the 16th century. Many of the monasteries around the stupa have opened their doors to foreign students, so you’ll see plenty of Western dharma students in maroon robes as you stroll around the backstreets.